Purchase prints of this prairie ↑ and other prints at the Wild Heart Mustangs SHOP. Want to saddle up and head out for an adventure, but not sure where to go? One of the most exciting places we have ever gone riding is Gettysburg, PA. There is no comparison seeing it on horseback, as both the Union and Confederate armies did as they arrived to this fateful place. Artillery Ridge Horse Park is a full service campgrounds for both you and your mount. We rode directly from the campgrounds to the battlefield for both our private tour and to ride on our own to discover more areas (such as Little Round Top). When not riding, hop in your car and only minutes away is historic downtown Gettysburg. This is a trip you will never forget! Camp with your horses and enjoy a unique equestrian and historical vacation! The Gettysburg Horse Park is THE ONLY FULL SERVICE HORSE FRIENDLY FACILITY with DIRECT access to the Gettysburg National Military Park horse trails for those looking to camp with their horses. Our facilities offer a warm﻿ up riding arena and round pen for your use and unlimited daylight access to the historic riding trails on the battlefield. For your selection we offer 10'x12' covered box stalls as well as single horse open gate corrals and 24'x32' two horse board ﻿corra﻿ls﻿. We are a full service facility offering equestrian day use, campsites with and without hookups, primitive as well as full service rental units, showers, picnic tables and fire rings, playgrounds, BRAND NEW IN GROUND HEATED POOL, game room, movie theater, pavilions and camp store. Reservations with a $30.00 per site deposit are required to hold your site. PLEASE HAVE AVAILABLE YOUR NEGATIVE COGGINS PAPERS AS WELL AS THE NAME OF YOUR LIABILITY INSURANCE COMPANY, THESE ARE REQUESTED FOR REGISTRATION AT CHECK IN. Accommodations for horses at Artillery Ridge Campground include box stalls, open stabling, and outside paddocks. ​Humans weren't the only creatures damaged by battles during the Civil War. Horses and mules also suffered injury and death. You'll find more information about that on our FREEDOM'S TRAIL page. Facilities at Artillery Ridge Campgrounds include basic tent sites, camp sites, and cabins, plus access to bathhouses. ← In the photo of the Historic Tate Building (at the left), you can see a hole on the lower part of the brick facing. That hole is from a cannon ball during the war at Gettysburg! A highlight of our visit was a private tour of Gettysburg, on horseback with our friends. There were beautiful vistas of historic countryside everywhere we looked. ← The War Horse Memorial in Richmond, VA. 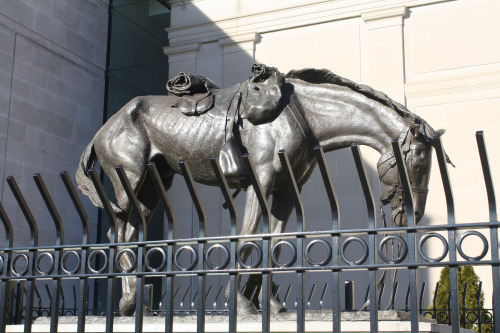 This statue commemorates the service and sacrifice of the horses and mules that served in the Civil War. ← The Gettysburg area has far more sights to see than we could manage in one trip. The photograph (left) of the Soldier's Orphans Homestead in 1867, reminds us of the lasting devastation of families during the Civil War. Girls are lined up on the left, and boys on the right, all of them collateral victims of the war.